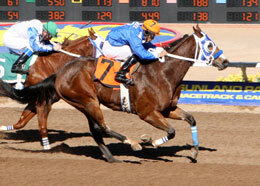 Im Rowdy James winning the first trial Friday to the Sunland Park Winter Quarter Horse Futurity. SUNLAND PARK, NM�DECEMBER 7, 2012�Royal Vista Stallions sired two finalists Friday afternoon to the Sunland Park Winter Quarter Horse Futurity. The 10 fastest qualifiers from the seven trial races will return to the Southeastern New Mexico Racetrack on Friday, December 28, and vie for the winner's portion of a $196,878 Grade 2 purse for two-year-old American Quarter Horses. Cherry Creek Futurity(RG3) winner Im Rowdy James raced to his fourth consecutive win in the first trial while setting the sixth fastest qualifying time of :19.246 seconds. Jose R. Gonzalez, Sr. conditions the IVORY JAMES gelding for Luis Rogelio Nava. He won the $73,650 Cherry Creek Futurity at Arapahoe Park on June 17. Bonifacio Perez rode the four-time winner from six starts this season. Bred in Colorado from the Especially Rare mare, Eyes Especially Rare, Im Rowdy James has earned $56,885 this season and has not lost a race since June 1. Bill and Marsha Drake are the breeders. Jess Makin Waves qualified from the fourth trial with a time of :19.263 seconds for owner/trainer Jamie Dominguez. Esgar Ramirez rode the WAVE CARVER filly out of Jess Genuine, by Mr Jess Perry. Bred in Texas by Bobby D. Cox, Jess Makin Waves also qualified to the $109,355 Grade 3 Rocky Mountain QH Futurity last summer. Earlier in the season, Jess Makin Waves won her trial to the $500,000 Ruidoso Futurity(G1). For the complete list of finalists, times, sires, dams, owners, breeders, trainers and jockeys to the Sunland Park Winter Quarter Horse Futurity CLICK HERE.